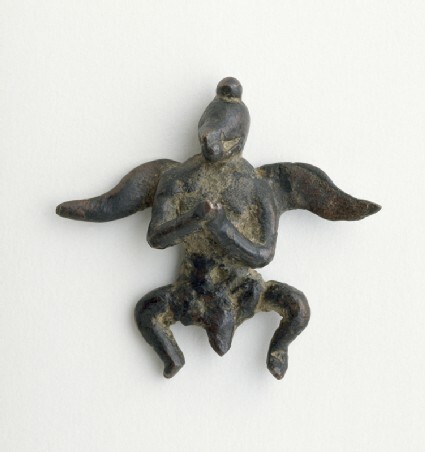 The morphology of this Garuda follows Nepalese conventions of the bird head surmounted by a round chignon, with a full beak, and narrow wings attached at shoulder level almost as appendages on an otherwise human male figure . He has no claws, and his hands are joined in the namaskara mudra of salutation . The open beak appears to be carrying a round jewel, possibly for distribution to the faithful. At his right shoulder a fold of a garment is visible as if a short cape were draped around the neck and collarbone. The waist is not very thin; the slender legs, also showing no indication of claws, are spread quite wide apart. A garment covering the thighs has a central section which is pendant. This may possibly have served to attach the figure to a mount. There are four beads at the waist, at proper left, and the remains of a belt, now missing other beads. The image appears to be solid cast. The casting is not polished at back or front. The back shows traces of pure copper in the rough surface. The wings are so thin that there was a break in the past, and the proper left wing is a modern restoration. This Garuda appears to be archaic in style and its function is hard to understand. The proper right foot is now missing a segment, but it does not appear that the legs were intended for attachment to a base. Due to the position of the hands extended in front of the body, it is also unlikely that it was worn as an amulet on the body of a devotee. The iconography of a jewel in the beak does not correspond to the mythology of Garuda as documented in the Kathmandu kingdom, nor to the Tibetan prehistorical mythology of the khyung. However, a possible explanation of the jewel clasped in the beak is the ancient Tibetan descriptions of a supernatural jewel as a sign of power, whether a cintamani, the jewel which fulfils all desires, held by the cakravartin or (through assimilation) by government ministers, whose exercise of political authority is held to correspond to the power of the cintamani . The jewel in the bird’s beak may therefore symbolize a cintamani jewel. Another possible link between the cult of Garuda and the distribution of wealth is that Garuda is the arch-conqueror of the Nagas (serpent deities), the guardians of the riches of the underground realms. Thus here perhaps we see Garuda carrying their jewel as a sign of his conquest. 1 Published by Anninos, ‘Tokches: Images of Change in Early Buddhist Tibet’, p.94, fig. 6, there identified as an eagle deity from Tibet; however see the khyung tokcha (cat. 43) for the typical Tibetan eagle deity, notably distinguished by the crescent-shaped horns beside the ears. 2 This mudra is the familiar position of the monumental kneeling Licchavi Garuda figures in Kathmandu: see Pal, The Arts of Nepal, vol. 1, pls. 98–102. 3 See quotations from ninth-century Tibetan manuscripts about the function of the jewel, translated and discussed by Stein, ‘Saint et divin: Un titre des rois tibétains et chinois’, p. 261.